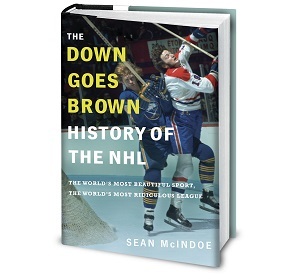 Down Goes Brown: Grantland: What Went Wrong for Brian Burke? Let’s start with the easy part: Brian Burke failed in Toronto. There’s really no way to spin it otherwise. Some people will try, because that’s how these things always work, but it’s futile. Brian Burke failed. He came to the Maple Leafs in 2008 when it seemed that the franchise had hit rock bottom, and, as general manager, he never made it significantly better. He missed the NHL playoffs all four years. He took over a team coming off an 83-point season that everyone agreed was a disaster and managed to top that total only once. He compiled a .490 winning percentage, which, in a league that gives out points for losing, is indisputably awful. All of that might have been acceptable if Burke, who was fired Wednesday, could point to an organization stocked with can’t-miss prospects. But the Leafs don’t even have that. The farm system is in better shape than it was when he inherited it, because it would've been nearly impossible for it not to be. But not by much, and with the (optimistically) possible exception of defenseman Morgan Rielly, it’s lacking the sort of top-tier young talent that almost all of today’s winning NHL teams are built around. No playoffs. No blue chips. No progress. And, increasingly, no hope. That’s failure, any way you cut it. So that’s the easy part. Now the harder question: Why? Why did someone who seemed like such a perfect fit for the job fail so spectacularly? The NHL uses points percentage and calls it win percentage now. I agree it makes no sense and fought against it for a while, but that ship has sailed. I don't write many responses, however i did some searching and wound up here "Grantland: What Went Wrong for Brian Burke?". And I do have some questions for you if you usually do not mind. Is it only me or does it appear like a few of the comments come across as if they are coming from brain dead visitors? :-P And, if you are writing on other social sites, I'd like to keеp up with everything frеѕh yοu hаvе to post. Facebook pаgе oг twitteг feeԁ? Too bad it happened. I am a big fan of him. "Burke spent the off-season figuring out how to replace Selanne, who along with the star defenseman Scott Niedermayer, is still deciding whether to retire." So why did he run out of time? The full answer hasn't been given. His lack of success on the ice with the leafs is the main one. But even that could be forgiven if there was a plan that existed outside burkea head. There have been hints that the relationship wasn't good. But that is once again an excuse. The suspicion is the new owners found there was a minimal an on paper and when they poked the bear to find out more the 75% owner was told to screw off. Burke agrees ownership has the right to make a choice, but Burke's terms of engagement was complete control. Both rogers and bell already own sports teams, so they had reasonable expectations of what a plan might look like. They didn't have to agree just they couldn't have the discussion because Burke didn't want to have it and he relied on the tannenbaums. The leafs won't get better and the viper pit will not end till the Tannenbaum group and all its hangers on that are on the board are gone. They meddle, but I suspect the bell and rogers group will minimize that over time. There are longstanding relationships between the tannenbaums and the rogers family so it will be delicate. Non is will play the corp game better and the new owners will let non is execute his plan once they understand it....see Rogers ans anthopolous with the jays.